Jameson Hartford and his wife, Abigail, return to their home in South Carolina to claim his inheritance, the Serenity Plantation, where he is determined to free all his workers and put an end to the evils of enslavement. He encounters hostility and hatred from family, friends, an entire community, and even his wife, as he steadfastly holds to his beliefs. Through the ordeal, he meets and falls in love with Delilah, one of his female workers, which further complicates the volatile situation. Outnumbered and alone, he must sacrifice everything as he attempts to liberate Delilah and her people, facing confrontations, treachery, and even betrayal, culminating in a final deadly showdown between precious freedom and extreme prejudice. 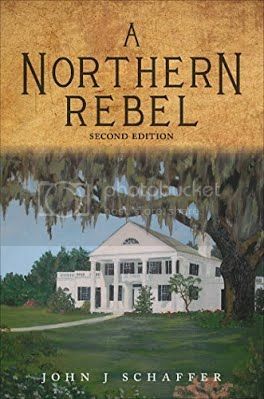 A Northern Rebel is a romantic adventure that touches on human emotions and forbidden love amidst the rich backdrop of the old South at the onset of the Civil War. events of the day: Abigail, Bethany Sue, and especially Delilah. open, letting the hot, moist air engulf him. absolutely beautiful bathed in the pale moonlight. the temptation and the lust. They wanted each other badly. pent up fear and anxiety in the beauty of the moment. each other, for they both knew the risks and perils of their tryst. memory for as long as possible until he could taste her once again. the other slaves in turmoil. John J Schaffer has always enjoyed writing. He graduated college receiving a BS degree majoring in Marketing, with a minor in Psychology. Working in advertising for various major pharmaceutical and industrial corporations, he created, wrote and produced a wide range of promotional materials and literature for dissemination to physicians and sales representatives, winning several AGA awards for his works. He has a vivid imagination for creating memorable characters and situations, being able to bring an original idea to life. This is John’s first novel, and he is currently working on the equally exciting sequel to this fascinating and poignant saga. John plays guitar and also writes songs, receiving accolades for his original compositions while being a part of a rock group in the 70’s. He has also played and sang at church services during that time period. John was born and grew up in Elizabeth and currently resides in Old Bridge Township, New Jersey.